Peacock by Malgorzata Pieczonka pseud Vangocha - 6.750" x 14.000"
Peacock metal print by Malgorzata Pieczonka pseud Vangocha. Bring your artwork to life with the stylish lines and added depth of a metal print. Your image gets printed directly onto a sheet of 1/16" thick aluminum. The aluminum sheet is offset from the wall by a 3/4" thick wooden frame which is attached to the back. The high gloss of the aluminum sheet complements the rich colors of any image to produce stunning results. 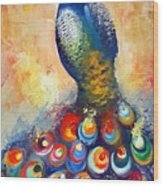 Peacock, painted on large long canvas, 100 x 50 cm. Abstarct version of this beatiful bird, his tail looks like it doesn't end. 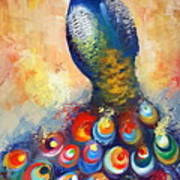 the blue colours of the bird contrasts with warm peach colour of the background. He stands proudly and let you enjoy his beauty.